BOOK NOW FOR SUMMER. THE KEYS ARE AWESOME IN THE SUMMER. Quiet, surreal, relaxing, breezes of the islands. extend your tan in the fall months..
Great Review and Great Rates. The condo complex consists of 36 units.. 3 Buildiong of 12 units....All units are corner units......Private heated pool and private beach... ...Palm trees, tropical plants, sunshine will surround you in Paradise. Your white sandy beach is private.....The property has a Tiki Hut at the waters edge where you can BBQ, on the gas grill and dine with your family or friends.......Watch dolphins play 20 yards off shore.....and relax in the heated pool..... The living room has a 40 inch flat screen TV with cable, HD and HBO... The condo has central air and password protected high-speed internet. The kitchen has granite counter tops, dishwasher, microwave, garbage disposal and ice maker... We have a pool, shuffle board, tiki hut with 2 gas grills and 3 tables for dining. We also have green space between our beach and building. We have additional green space along the East side of our property. Our landscaping consists of palm trees and colorful native tropical flowering trees and shrubs. Each Condo has its own parking space marked with it's condo number. We are as close as walking distance to a 5 minute drive to great ocean-side restaurants, kayaking, snorkeling, jet skiing, fishing charters, diving, Dolphin Research Center, Turtle Hospital and State Parks. .Work on you summer tan while relaxing by the pool or ocean sipping on your favorite cocktail and soaking up the sun!!!! ...... Relax in the sun, read a book, play on you tablet or I Pad while working on your tan, overlooking the heated pool or admiring the blue green ocean........It is so relaxing, its like tranquility. Reserve your fun in the sun------ 1st floor condo...private heated pool ..... and please do not forget about the private pristine sandy beach only for the tenants of the complex......located on the Atlantic Ocean. Begin each morning with a cup of coffee on your private patio off the master bedroom reading the morning paper or a book or catching up on your emails------listen to the birds sing and view the flowering shrubbery and many many palm trees and nature just inches from your fingertips. If you want to feel like a kid again, try shuffleboard. Walk, jog or bike along the bike path that is lined with palm trees to mail a postcard to your family or friends that is within walking distance of the condo. For the photographer----take a short walk to Sunset Park where you can photograph the most beautiful sunsets in the World or if you are an early riser, photograph the sunrise from our private beach. Snorkeling and diving are all within a few minutes drive, or please feel free to snorkel at the condominium's private beach and try to identify the many fish. On the Island of Key Colony Beach, you will will find restaurants, fishing, boutiques, coffee shop, restaurants with bars and live music.. Within a few minutes drive you will find numerous restaurants from fast food to gourmet dining and a variety of boutiques and stores for your shopping pleasure---A few of the restaurants and boutiques are within easy walking distance of the condo. 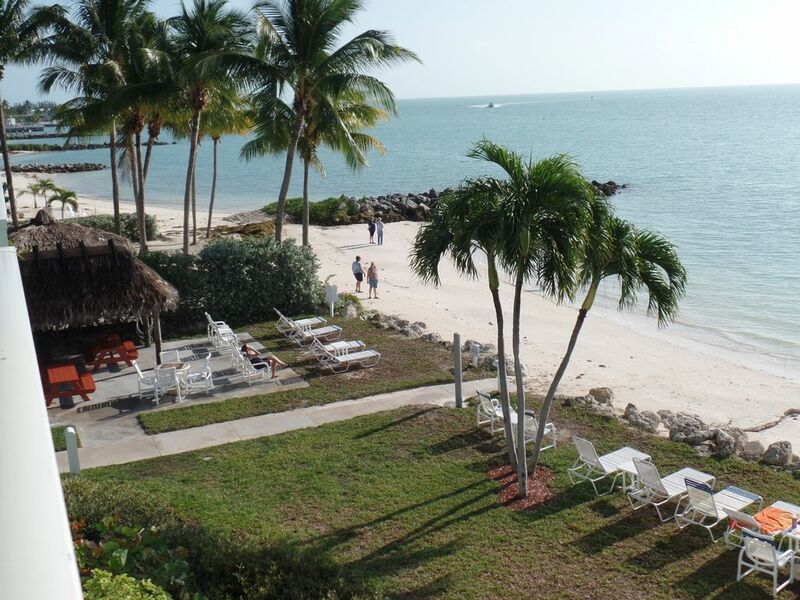 My Husband and I love the Keys.........Key Colony Beach is the Gem of the Florida Keys. It is a very small island and there are no properties higher than 3 stories. The island is so relaxing with all the flowering shrubbery and palm trees. You can walk anytime of day or night. The Island has the most breath-taking sunsets in the World. Come visit and find out for yourself. The biggest decision in the morning after having your morning coffee on the patio is do we go to the beach or the pool?. (2) coin-operated washer dryers are located on the condo complex for guests. (2) coin-operated washers dryers are located on the condo complex for quests. 9 hole par 3 golf course 2 blocks away. What a great place for us to spend our vacation in the Keys! This was definitely one of the best stocked condos we’ve ever stayed at. And it was clean and very comfortable! The grounds were beautiful, the pool was wonderful, and you are right on the ocean should you want a swim! Loved the tiki hut amenities as well!! We would definitely stay here again. We had a amazing week at Diane's condo! The condo was wonderful and perfect for our family of 4. Everything was beautiful and you would never know this area was hit so hard with the recent hurricane. We loved the first floor access and being able to walk directly out to the beach from the patio. The beach was beautiful, quiet and very relaxing. We also enjoyed swimming in the pool. We could have just stayed at the condo all week enjoying the beach but since it was our first trip to the Keys we kept busy enjoying the many restaurants and beaches close by as well as driving down to Key West twice where we went on a all day Catamaran sports adventure trip with Sebago. It was so much fun! End of the day highlight was always Sunset Park watching the amazing sunset!!! We definitely want to book again soon and can't imagine a more perfect place for us to stay. Thanks Diane! Thank you so very much for the review. My husband and I are so happy you enjoyed yourselves. Key Colony Beach, you always want to return. This was our first family vacation to the beach with our boys. We absolutely loved the private beach & pool. They ran back & forth about every 10 minutes! Thank you for sharing your place, we had a great time! My husband and I and our 2 teenage boys love Diane’s condo and the Florida Keys! Diane is so easy to work with and everything has always gone absolutely perfect. This is our second year in a row staying here and we are planning for a third trip next summer. During our stays we have enjoyed swimming with the dolphins (an incredible opportunity for a family from Ohio! ), snorkeling through John Pennecamp State Park (amazing...), private fishing charter trips (dinner! ), fishing and snorkeling off our own private beach, sunsets at Sunset Park (2 minute walk-Beautiful! ), and day trips to Key West (FUN!). When we are not busy... relaxing at the beach is incredible... crystal clear water and white sandy beach. Love the iguanas! Evening games of shuffleboard are also lots of fun. Happy hour at Sparkys Landing and Sunset Grille are the best! Don’t forget to feed the tarpon at Robbie’s!!! This condo is great. Its my second time staying here and wont be my last. The location is perfect everything is within a few feet the pool, beach. We had a great relaxing vacation and diane's condo was fantastic. A wonderful beach vacation experience. Everything was there that we needed. Especially enjoyed the suppers on the balcony. Being on the first floor was very convenient, too. Within a 5 minute drive you will find numerous restaurants from fast food to gourmet dining and a variety of boutiques and stores for your shopping pleasure----entertainment----or walk to the restaurants and boutiques near our condo via the walking path lined with palm trees and flowering shrubbery..